Portland, ME - Waverly A. Turgo (Wormwood) 78, passed away peacefully on April 5, 2018 at Maine Medical Center in Portland. Waverly was born on December 5, 1939 at Mercy Hospital in Portland to Edwin Wormwood and Velma Veldina Jones of East Sebago. She attended primary and secondary school at Potter Academy in Sebago. Early in her life, she attended school for Secretarial Science and worked as a personal secretary for business firms in Boston and Portland. She then worked in Custodial Service for Crosby Loughlin Steel Mill on Fore Street in Portland. In her later years, she found her calling in early childhood development as a pre-school teacher at the Portland YMCA Childcare Program, where she had the privilege of tutoring her own grandson and many more of Greater Portland’s inner-city children. Waverly was a country girl from a remarkably well regarded family in Sebago; she was one of six children and her beginnings were humble. These formative years would be the catalyst for her reputation as a person that would teach life-long lessons of acceptance, forgiveness, encouragement, sharing and mentoring throughout her life. All of this done with great care, love and understanding. Portland, where she eventually moved to and would call home. She started out in Sagamore Village as a young mother and would soon find a home in Munjoy Hill where she would live for nine years, raising three children. It wasn’t until she moved to Danforth Heights in the West End where she planted her family roots and made an indelible mark on the lives of others. Most knew Waverly as a loving, kind soul; however, she had a balance of sternness and feistiness that provided a good balance and ultimately garnered great respect. She had taken in as many twenty misguided children and adults that had lost their way in life over a span of fifty years. She was somewhat of an unofficial foster parent that would not say no to someone in need. Whether a person suffered through neglect, abuse addiction, or alcoholism she was always there for people. Some stayed and accepted shelter, shower and food for a day; others would stay for months and even years. She could find the beautiful soul in people and cultivate it, always encouraging a sense of self-belief, confidence, strength within and renewal that would eventually prepare them for the world again. Wavery had experienced great loss and grief, and she experienced great joy and success, both on her own and through her children. In the end despite pain and suffering, she smiled more than any other time in her life, because she knew she left a legacy of a truly wonderful person who had given far more than she received. Her greatest accomplishment came in 2003 when as a Foster Grandparent through the Friends Program of Manchester, NH she volunteered for a youth mentoring program. She chose to work with troubled at risk youth ages 6-17 years old. That year she received a national recognition from then President George W. bush as Volunteer Foster Grandparent of the year for the State of New Hampshire, it was the at risk youth that she mentored and loved, that nominated her and subsequently campaigned for the recognition. Waverly enjoyed sketching, art, whittling, music, dancing, singing, cooking, the outdoors, the beach, swimming, old time westerns and a good joke. She is predeceased by her parents Edwin and Velma (Veldina) Wormwood of Sebago ME, brother Alston Wormwood of Standish ME, sisters Wildreth Burnell of Sebago ME, Sharon Demers of Bridgton ME, Donna Lee of Bar Harbor and her loving partner Paul Gleisberg formerly of Manchester, NH. Waverly is survived by her two daughters Melody L. LaJoie and her husband Rodney LaJoie of Waterboro ME and Bethany M. Dyer of Buxton ME; her two sons Christopher Dyer of Biddeford ME and Joel F. Turgo and his fiancé Lisa A. Platt of Portland ME and her brother Roald Wormwood of Alfred, ME. She is also survived by Marvin Ewing of Maine-father of Melody, her former husband’s Roger Dyer of Maine and Florencio (Joe) Turgo of Fairfield CA. 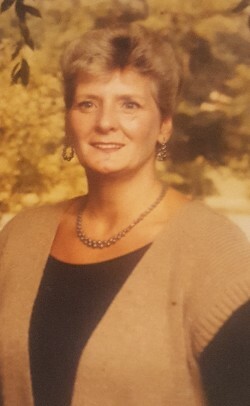 She also leaves behind six Grandchildren, Justin Perry of Porter ME, and predeased granddaughter in law, Rebecca Perry, Brandon Perry and Emily Barkley of Otisfild, ME, Kasie Wooley of Chelsea, ME, Kendon Perry of Otisfield, ME, Jamie Carda of Minneapolis, MN, Christopher LaJoie of Parsonfield, ME as well as ten Great Grandchildren and one Great Great Grandchild. Relatives and friends are invited to attend the memorial visitation on Sunday April 15, 2018 at the Maine Irish Heritage Center, 34 Gray St. Portland ME, from 1 - 4 pm with a time of remembrance and sharing to begin at 3:00 pm in the upstairs chapel. A reception and celebration of Waverly’s life will be held in the downstairs function hall from 4 - 6pm.